Date of the observation: August, 1992, 11.56 p.m. to 12.10 a.m. The farmer was out in the field along with his assistant for to harvest the grain, as they both suddenly becomes blinded by a bright light. When they look in the direction of the light, they observe the one giant object in the air, just above the trees at the forest. 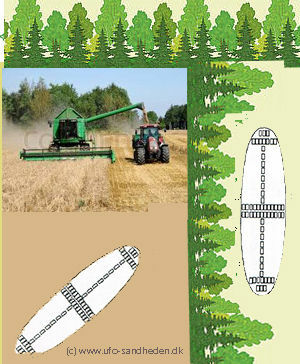 There are woods on two sides of the field, as the drawing shows. 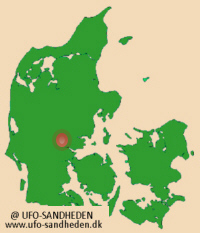 The UFO location, since the two agricultural people observed the UFO hanging just above the treetops. 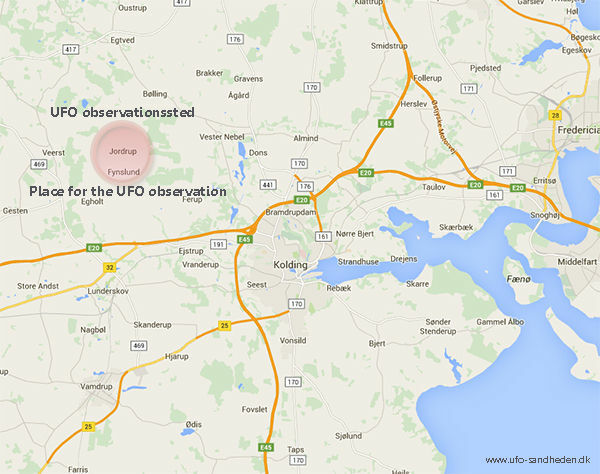 The UFO is calculated an estimated to be 80 meters long. They stop the machines, but can't hear any sound. There are quiet. Both of them just stare at this terrifying object. After about 5 minutes, the object hovering slowly – the sharp light is slowed down, but still no sound, totally silently — hovering slowly across the field at an elevation of around 50 metres, and only about 150 meters from the two agricultural people, after which it slowly slips out of sight. There remains two people, dumbstruck and astonished, but also scared of this unknown object, but otherwise they are both unharmed. The object is estimated to be around 80 metres long. The two eye witnesses reported that they could see the countless "windows", and it looked to the light behind the Windows were bluish. Farm owner's Assistant tried to count the number of "Windows", and he believeste that could count 25 "Windows" vertically in the middle, but he gave up counting horizontally. Both the farmer as a farm worker wants to be anonymous, across from the public.